Blackhawk 20LO00BK BlackHawk Load Out Bag (Without Wheels) FREE SHIPPING! The Blackhawk model 20LO00BK contains 9 interior mesh pouches for gear storage, fully accessible hinge-type lid, hide-away carry handle, full wrap around carry handle, (2) end cap carry handles, (4) clear ID insert pockets, (2) on top, one at each end. Made with (2) layers of our NyTaneon® 1000 denier nylon for superior use and abuse. 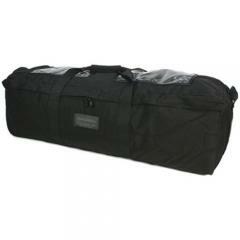 ©2002-2019 CopsPlus.com: Blackhawk 20LO00BK BlackHawk Load Out Bag (Without Wheels) FREE SHIPPING!